Long-winded professionals make lousy leaders. 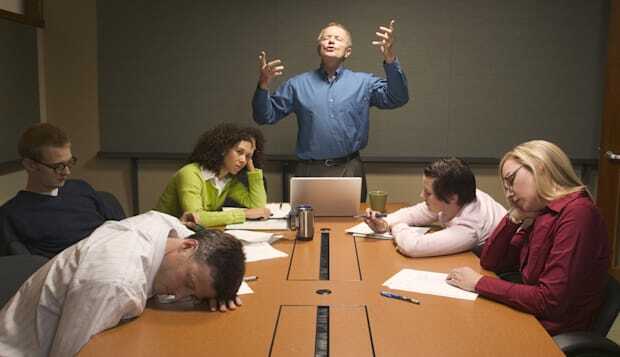 You feel no inspiration hearing them tear through another management monologue. You can't readily recall the most important messages from the last lengthy lecture you heard from senior leadership, and you're tired of hearing executives repeat themselves over and over again. The brutal reality in business today is that verbose leaders have few followers. In today's world of constant connectivity and endless information, brevity is now a leadership necessity, not a nicety. Getting to the point quickly is the new, non-negotiable standard for senior managers to climb through the ranks and lead in an attention economy. Effective leaders take extra time to prepare the point they want to make before delivering it. Start by reviewing outlines and creating rough drafts of your key ideas in advance. Be direct and say what's on your mind; don't carelessly or inadvertently unleash everything that's in your mind. Be disciplined to know the story you want to tell and how it connects together beginning to end. Know your audience and their appetite for detail. Some love lots of minutiae, while others get easily distracted by too much information. Trim out needless points that will only weigh people down. Effective leaders are great storytellers who love to share good, short and relevant stories while always avoiding the hard sell. Illustrate ideas with the personal and practical anecdotes people crave. Active listening and asking pointed, open-ended questions is the key to unlocking many doors. An essential to saying less is letting others around you talk more. More than 70 percent of people are visual learners, so satisfy their preference to see pictures, not consume more confusing words. Showing short videos or sharing infographics is a powerful way to be clear. When you're confident you've hit the mark, stop talking. Resist the temptation to say, "and one more thing." Enough said. Effective executives get to the point. A president of a Fortune 1000 manufacturing firm once confided to me that he evaluates up-and-coming managers by how confidently and concisely they communicate. "When they interact with me, it's more than just how they perform in high-pressure meetings and boardroom presentations, but how disciplined they are in variety of day-to-day scenarios like email, impromptu conversations, conference calls and progress reports," he said. "There's so much information at their fingertips, and it's not easy for them to control it." Overcoming these obstacles can be daunting. An accomplished lawyer who works at the Pentagon recently complained to me, "Nowhere in grad school or in my lengthy military career was I instructed on how to be brief." So, how can a talented and ambitious professional gain mastery of this valuable yet evasive skill other than through trial and error? These are specific, real-world skills that accomplished leaders learn to master to be clear, concise and compelling when dealing with others. When any of these are missing, they lose their grip. What's more, effective executives are extremely aware of the moments in a business day where this brevity muscle needs to be exerted. Put your brevity to work not only in meetings and in emails, but also when interviewing, sharing bad news and making small talk with your colleagues. Even if you don't consider yourself an expert in the subject at hand, be conscious that getting to the point is a clear indication of professionalism and respect. Joe McCormack founded and serves as managing director of The Sheffield Company, and he founded The BRIEF Lab in 2013 with facilities in Chicago, IL and Southern Pines, NC. His new book, Brief: Make a Bigger Impact by Saying Less (Wiley & Sons, 2014), tackles the timeliness of the "less is more" mandate.